Last week IAM Local 1501 held their annual “Hawgs for Dogs” motorcycle ride raising over $5,700 for Guide Dogs of America. IAM District 751 volunteers spent their afternoon building a wheel chair ramp for a deserving recipient, giving her the mobility and freedom to travel in and out of her home with ease. 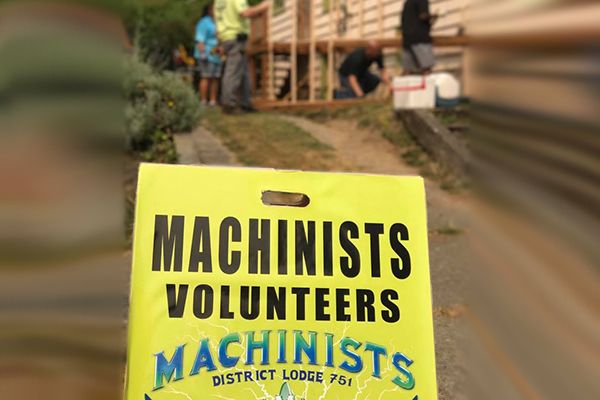 The IAM Local 63 Young Machinists Committee enjoyed an afternoon of comradery and shooting each other in a paintball competition to promote and sell raffle tickets to raise money in support of Northwest Battle Buddies and Gales Creek Foundation.